A few bottled products are used for these dishes, not necessarily as shortcuts-although welcome, but because they add a truly unique flavor boost! Preheat (toaster) oven to 350°. 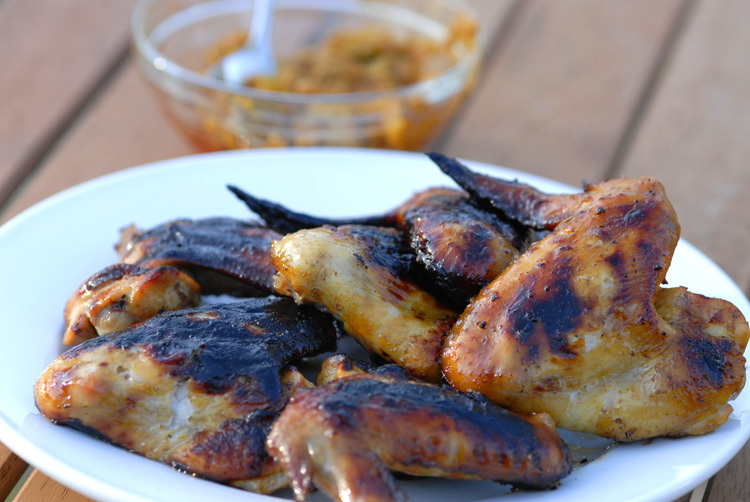 Place wings in a sealable container, add sauce and salt and mix thouroughly. 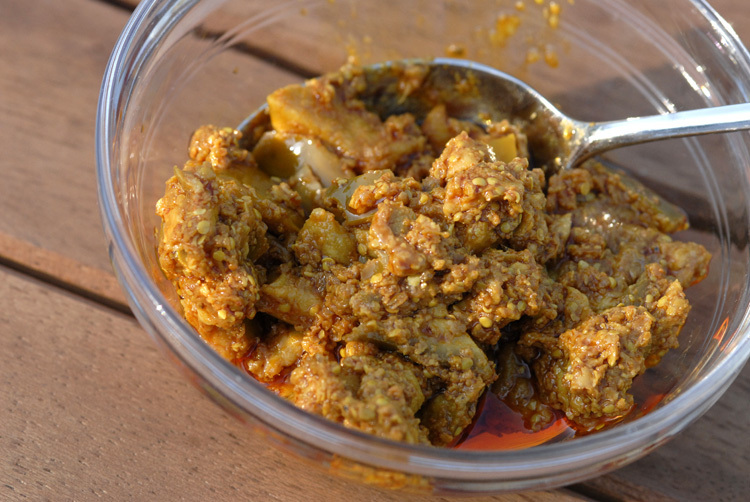 Let marinate for 1-3 hours in the refrigerator. Spray a sheet pan with non-stick spray and line with foil. Spray the top of the foil with non-stick spray as well. Place the wings on the sheet pan so they don’t touch. Bake wings for about 3o minutes. Meanwhile, prepare or preheat the BBQ for a 2 station area – one at about 300° and the other about 350°. Your shrimp will cook over the 300° and your chicken will brown over the 350° area. Preheat (toaster) oven to 400°. 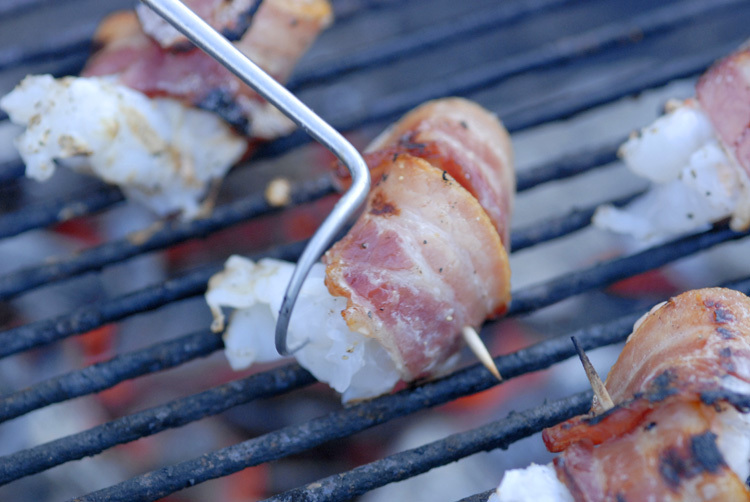 Place a wire rack into a rimmed pan and lay the strips of bacon on the rack. Bake the bacon for 10 minutes. Remove pan from oven. Add a grind or two of pepper. Turn bacon over and brush with maple syrup, adding more pepper. Bake for another 3 minutes. Place bacon maple side up on paper towels. The bacon should be soft, pliable and just about cooked through. Cool. Remove the shells and de-vine shrimp. Season with salt and pepper. 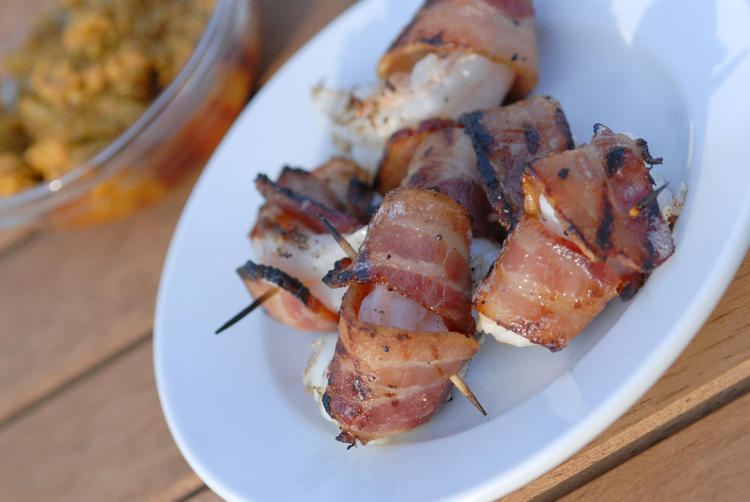 Wrap each shrimp with maple bacon and secure with a soaked toothpick. 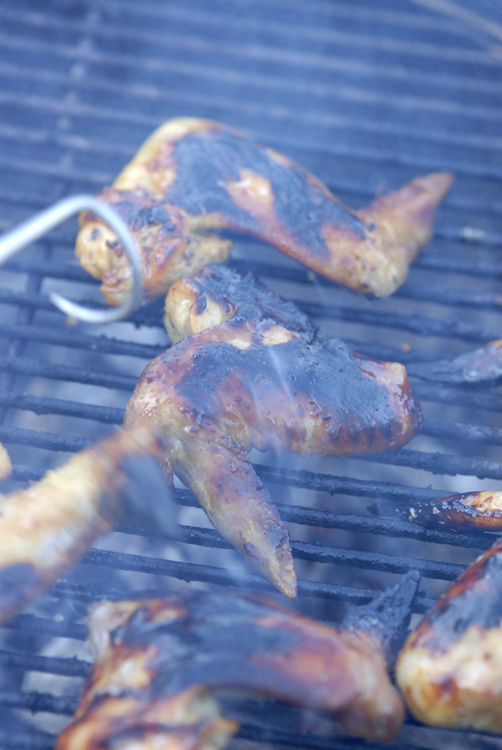 When your BBQ is ready, place the wings over your hotter station and the shrimp on the cooler one. Watch, and turn each piece so that it browns but doesn’t burn, moving if necessary. Cook for about 5-10 minutes. 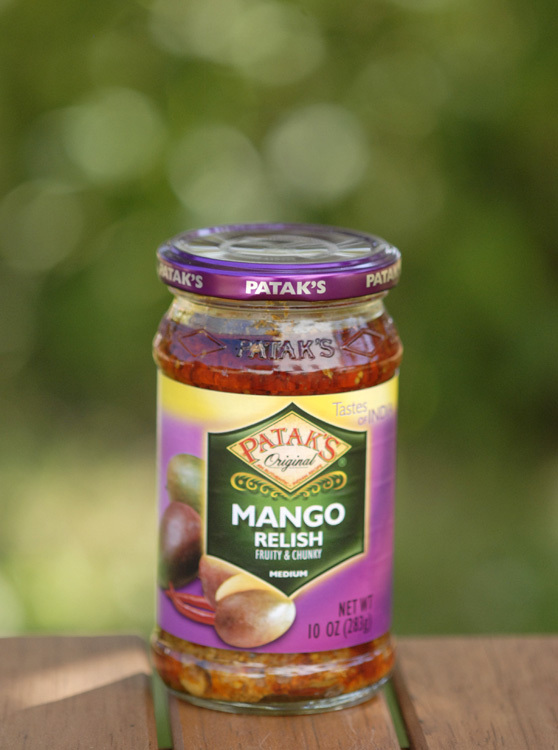 Use Patak’s® Medium Mango Relish as a dip for both the wings and the shrimp. 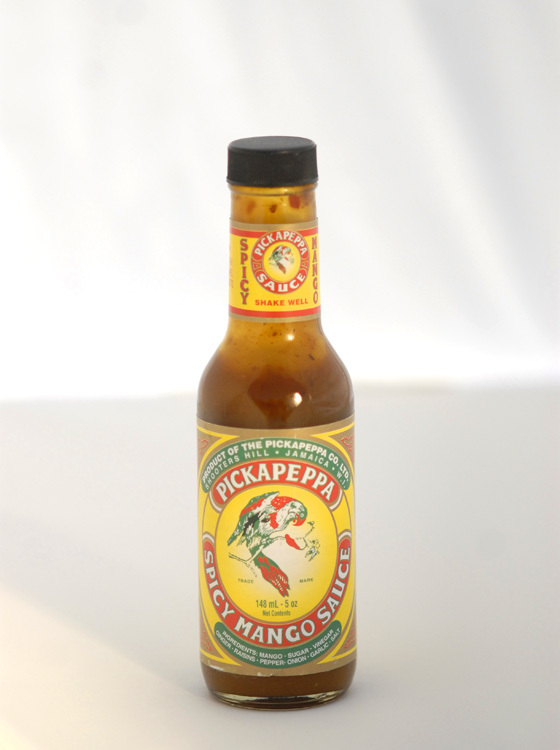 The Patak’s® Mango Relish medium is actually pretty darn spicy so a little can go a long way. It’s intense and very unique flavor adds an amazing dimension to many dishes. This entry was posted in appetizers, entree, recipes, Uncategorized and tagged appetizer, bacon, barbeque, BBQ, Caribbean, chicken, cooking, dinner, dish, entree, fish, food, fruit, grill, hot, Indian, Jamaican, main, mango, outdoors, oven, party, recipe, seafood, shrimp, side, spicy by MixedSoup. Bookmark the permalink.